Creative Writing Course with Hayley Doyle! The Untitled Chapters has some great news! A new Creative Writing course will be commencing in October! Hayley Doyle, the creator of Creative Writing Dubai has given several creative writing courses before and in October, a new course will be starting once more! Duration: 4 weeks. This will also include a one-to-one session/consultancy with Hayley once writers have written enough material for her to assess. More details will be explained about this session during the first meeting. It will include a one-to-one session with Hayley when you are ready to discuss your work. Hayley will explain more about this during our first session. The group will discuss all kinds of things, Hayley specifically teaches dialogue, character creation, how to push yourself, improvisational writing and the importance of setting. The first week will require simply yourself and a notebook and pen. Please bring a notebook rather than an iPad, as it feels more organic! We will be looking at improvisational writing and unlocking the imagination in the first session, plus looking at some other starter techniques. 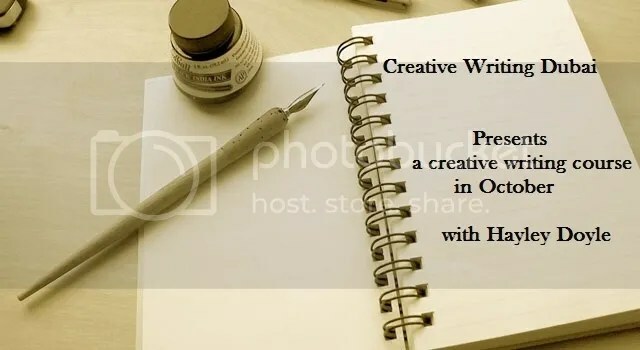 If interested, please send me an email with your phone number and full name if you intend to join on Monday 21 October to Hayley through this email (creativewritingdubai@gmail.com) and let her know you are interested as soon as possible.